The Zhyphen Mobile range is truly a mobile energy source with the range starting at 50w to 1509w. Ideal for running LED lights, charging phone or powering any device depending on demand. Can be supplied with a folding solar panel for recharging or can be charged from the grid. Plug and Play LED light kit can also be supplied. Our unique battery management system (BMS) allows for only 80% deep discharge (DoD) typically doubling the lifespan compared to 100% DoD. Zhyphen VACMS enables a secondary lithium iron phosphate (LFP) based power system to be correctly and efficiently charged via the vehicle alternator. Standard alternators are designed for charging lead acid batteries for starting the vehicle’s engine. Conventional in-vehicle power systems use deep cycle lead acid or AGM batteries, which are charged direct from the alternator. These are inefficient, heavy, high maintenance, take up lots of space and have a short lifespan. Lithium batteries provide a superior power solution with advantages on every aspect. However, these cannot be safely or effectively charged directly from a conventional alternator. The VACMS is the optimised solution. The module monitors the vehicle’s starter battery voltage, as well as monitoring the state of charge of the auxiliary lithium battery from its BMS and intelligently controls charge into the secondary power system. Protection is built in to prevent the starter battery from being drained and charging only takes place when the engine is running. Integrated DC-DC boosting conversion enables the lithium batteries to be charged at the correct voltage level. 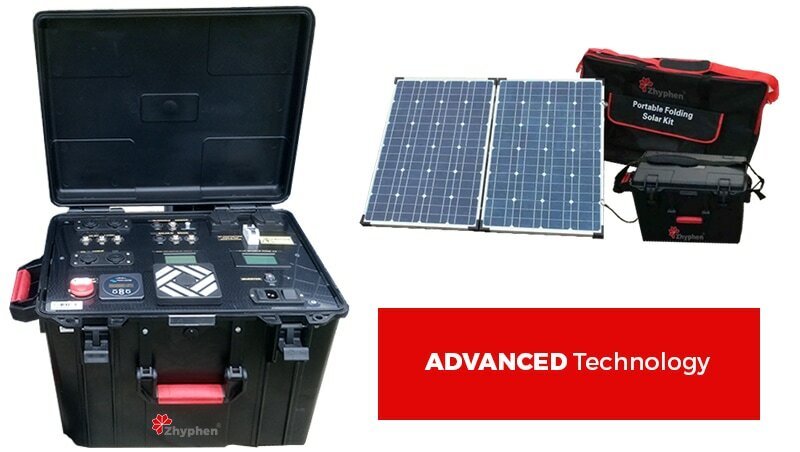 This new technology is integrated as standard within all Zhyphen SPP500, SPP1500 and SPP3000 series portable power systems, enabling them to be charged directly from any vehicle. The technology is also available as separate modules and can be scaled to meet end users’ power requirements; currently from 5A to 120A charge current at 12Vdc or 24Vdc.